Enter the street bazaarâ€¦the enticing sights, sounds and flavor of the marketplace are everywhere! 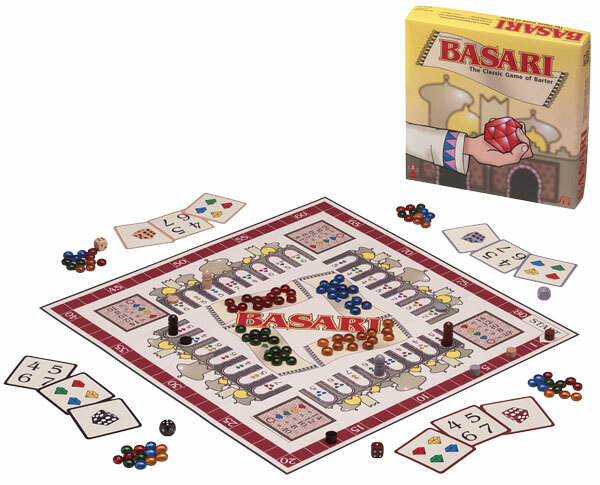 In BASARIÂ® players act as merchants who compete on the streets of a lucrative gem marketplace. Each round, players earn valuable points by haggling and bartering for precious gemstones. The player with the most points after three rounds wins BASARI. There is a lot of game packed in this little box! In particular, this game has a very unique mechanic (well, also in Edel, Stein, & Reich, which is a sibling to this but not available in USA) where two players need to make a deal for which can carry out an action that they both want, and to do so they barter using a very clever bartering system. Still fairly light, with randomness of dice, but great fun for those who don't mind that sort of thing. Basari has a wonderful innovate take on simultanious action selection - there are only 3 actions available to choose and if 2 players choose the same one, they have to negotiate to settle who gets to do the action. This introduces both bluffing and player interaction in a very entertaining way.